I really hate to bring it up again, but it’s going to be news for awhile, still. As I predicted, the oil spill in the Gulf is going to continue flowing until probably sometime in early fall when their alternate drilling paths can take the pressure off. For now, millions of gallons a day are spewing into the Gulf. 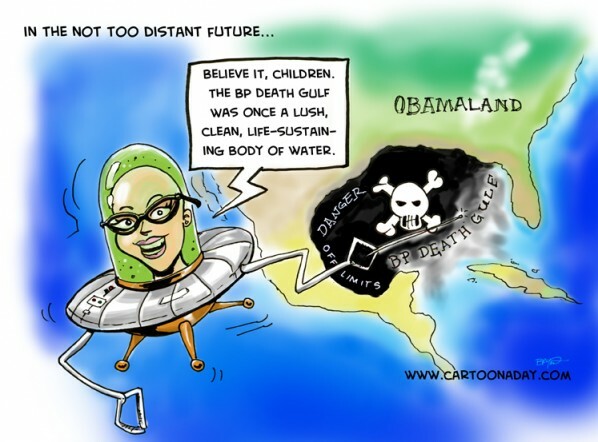 Today’s cartoon a day illustrates a (possible) near future when teachers explain how the Gulf Coast USED to be rich with life and not a toxic oil dump. By the way, the teacher is a ‘HEADmistress’. A floating headmistress teaches the viewer about when the Gulf Coast was lush and verdant. This is a possible future.